Premier Pest Management offers wasp pest control services to residents and business owners in Southwest Florida. Conveniently headquartered in Naples Florida we offer quick and reliable services. 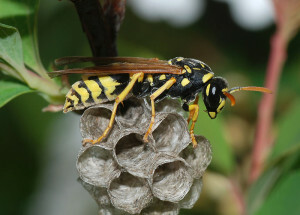 There are a few different types of wasps common in the Naples area such as the yellow-jacket, mud-dauber and paper wasp. Click that link for more pictures. Feel free to contact us at (239) 435-0196. Based in Naples, we offer service across SWFL from Marco Island to Estero. Image info.